Not the situation you want your offense in. There are some situations you simply just cannot plan for. Oregon State found themselves in one of those tough spots Saturday night against Washington State when they had to decide what to do on 3rd and 55. This may surprise you, but the Beavers were unsuccessful in converting the 3rd and very very very long. How Oregon State found themselves in a 3rd and 55 had to be frustrating for head coach Jonathan Smith. On a drive that started at the Oregon State 17-yard line in the fourth quarter, the Beavers appeared to be moving well as they entered Washington State territory. But on first down from the WSU 23-yard line, Jack Colletto was taken down for a loss of nine yards as Oregon State recovered a fumble. On 2nd & 19, Jermar Jefferson was stuffed for a loss of one yard to pin Oregon State into a 3rd & 20 situation. Colletto completed a 19-yard pass to the Washington State 14-yard line, but the Beavers were called for holding, a 10-yard penalty. On 3rd & 30, Colletto again completed a pass, this time appearing to convert for a first down on a 38-yard pass. But once again, a holding penalty negated the play and pushed Oregon State back another 10 yards. On the same play, wide receiver Timmy Hernandez was flagged for unsportsmanlike conduct, tacking on another 15 yards the other way. 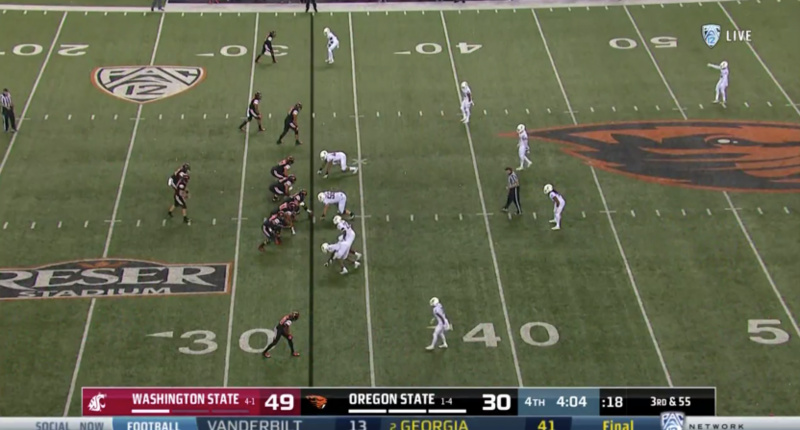 With no real play to call on 3rd & 55, Oregon State simply tried going with a short pass to gain back at least a few yards before inevitably having to punt to the Cougars. To wrap this all up, the Oregon State punt traveled about 54 yards, landing just shy of the first-down line. You simply don’t see third-and-long plays quite like this every week. It was only fitting this happened during the #Pac12AfterDark hours.